Valhalla, N.Y., April 2, 2018 – This year’s NAB (National Association of Broadcasters) convention will see the continued expansion of the FUJINON 4K HDR lens range from the Optical Devices Division of FUJIFILM. 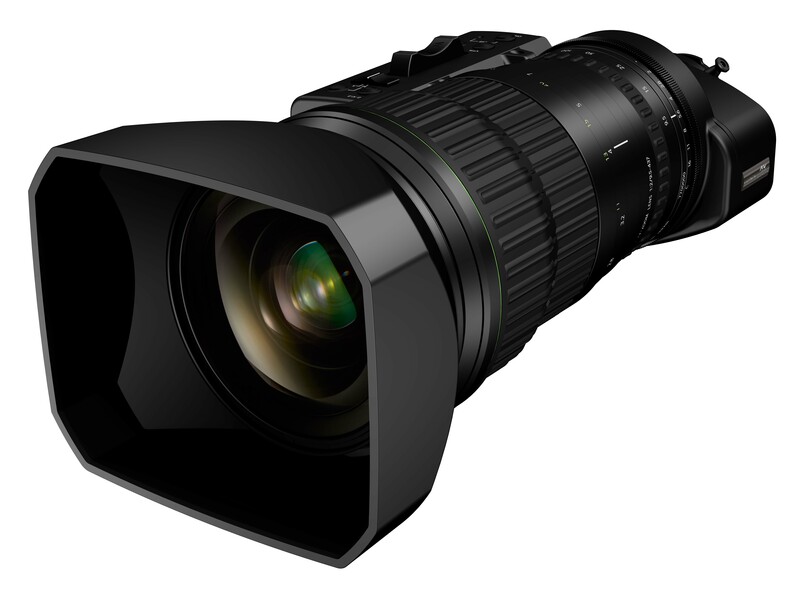 Fujifilm made the Development Announcement on Tuesday, March 27 in Japan of the company’s latest Premier UA Series of UHD 2/3” lenses, the UA46x9.5B and UA46x13.5B. A prototype will be shown at the Fujifilm booth (#C7225). NAB2018 will be held from April 9-12 at the Las Vegas Convention Center. A newly designed OS-TECH image stabilizer provides the most advanced image stabilization for a lens in this class and makes the new UA46x zooms ideal for sports, wildlife, and documentary production. Versions of each lens will be available for studio, wildlife, remote-control and gyro-stabilized productions. Also enhanced with a fresh design is the Digital Full Servo Drive Unit, which now features 16-bit encoding for highly accurate local or remote operation of the zoom, focus or iris. The drive unit offers a “Virtual Connector,” which outputs the lens’ positional data. In line with the optical performance of the full family of 10 FUJIFILM 4K UA 2/3” lenses, the two new lenses feature 4K Ultra HD and HDR optical performance throughout the entire zoom range. The UA46x9.5B features a class-leading 46x zoom ratio and a wide angle from 9.5~437mm (19~874mm w/2x) with an F2.0 aperture. The “Tele” version UA46x13.5B lens also features a class-leading 46x zoom ratio and a telephoto reach from 13.5~621mm (27~1242mm w/2x) with an F2.8 aperture. The lenses employ the latest High Transmittance Electron Beam Coating (HT-EBC), resulting in richer colors and greatly improved blue response and transmittance. They both achieve 4K UHD optical performance from center to corner throughout the zoom range while suppressing image distortion, due to a multi-group zoom system. Availability for the UA46x9.5B and UA46x13.5Bis planned for late 2018. Another Premier UA Series of UHD 2/3” lens will be a booth highlight in Las Vegas. First introduced at IBC2017, the UA24x7.8 will make its NAB debut. With a total length of 8.68“ (220.5mm) and weight of 4.36 lbs. (1.98kg), the UA24x7.8 zoom is the smallest and lightest 4K HDR broadcast lens. Its compact body offers a powerful 24x high magnification zoom, covering a focal length from the wide angle of 7.8mm to 187mm (374 with the 2x extender.) This new portable lens allows users to shoot high-resolution video in environments requiring significant mobility and extended shoulder time, such as live sports news and reality TV. The Premier UA Series of 4K 2/3” lenses is the first series designed specifically for UHD broadcast applications. Other handheld zooms in this line up include: the UA14x4.5, UA18x5.5, UA13x4.5 and UA22x8lenses. The UA27x6.5 studio lens and field lenses, the UA80x9 and UA107x8.4, round out the series. Thanks to the extreme popularity of the FUJINON MK lenses, third party providers have introduced a range of solutions to benefit MK lens owners and broaden their compatibility. One of the most popular accessories are additional camera mounts. MK Series lenses come standard with an E Mount. Showcased in the Fujifilm NAB booth will be the Duclos Lenses’ FZ mount, which allows the lens to work with the popular Sony F5 and F55 cameras. Also shown at NAB, will be MTF’s Micro Four Thirds mount for the MK series. This mount allows for use on Panasonic, JVC, and other manufacturers’ cameras. Among those with new gear for the FUJINON MK Series are lens control, accessory manufacturers and service providers: Heden, Chrosziel, Bright Tangerine and Zacuto. In addition, the new Duclos 1.7x expander enables FUJINON Cabrio and Premier SeriesSuper 35mm zooms to be used on the latest larger sensor cameras, such as Sony’s Venice, RED’s Vista Vision 8K, and ARRI Alexa LF. With a unique combination fast T stops and exceptional optical performance, the HK Premier lenses are PL-mount zooms poised for both current and emerging digital cinematography trends. The Electronic Imaging Division will have a dedicated space in the Fujifilm NAB2018 booth to showcase the new FUJIFILM X-H1 camera and FUJINON MKX18-55mmT2.9 and FUJINON MKX50-135mmT2.9 cinema lenses for X Mount, providing the ideal compact combination for both video reproduction and still photography. The X-H1 is the first camera in the X Series line to feature in-body image stabilization and produces uncompromised image quality and precision when combined with compensating mechanisms. This camera also brings a comprehensive range of new features to the market to support movie production, including ETERNA, a new film simulation mode that is ideal for shooting movies. The X-H1 boasts many functional and performance improvements to video image quality, including the 1080/120P high-speed video mode (1/2, 1/4 and 1/5 speed slow motion) for recording spectacular slow-motion footage; F-log SD card recording which aids smooth workflow; a DCI 4K shooting mode (4096×2160); a 400% dynamic range setting (approximately 12 stops); 200 Mbps high bit rate recording; a high-sound quality internal microphone (24 bit/48 kHz); and verbal time codes. The new X Mount FUJINON MKX18-55mmT2.9 and FUJINON MKX50-135mmT2.9 cinema lenses are compatible with all FUJIFILM X Series interchangeable system cameras and offer a lightweight and compact design with the same optical performance and operability as larger cinema lenses in their class. They cover 18-135mm–the most frequently used focal length in video production–and achieve a constant T2.9 aperture across the entire zoom range, enabling a shallow depth of field and beautiful bokeh effect. The optical and mechanical approach employed in these new MKX lenses is ideal for video shooting, allowing for elimination of time lag that is usually experienced with electrical control systems, suppression of focus shifts while zooming, and reduction of lens breathing to ensure continuous sharp output. The new MKX cinema lenses will be available in Spring/Summer 2018 in the U.S. and Canada; the FUJINON MKX18-55mmT2.9 for USD $3,999.95 and CAD $4,999.99, and the FUJINON MKX50-135mmT2.9 for USD $4,299.95 and CAD $5,374.99. This entry was posted in Fuji lenses and tagged Fuji Rumors, Fujifilm, Fujifilm Rumors, FujifilmRumors, Fujinon MK18-55mm T2.9, Fujinon MK50-135mm T2.9, Fujirumors, UA46x13.5B, UA46x9.5B. Bookmark the permalink. Trackbacks are closed, but you can post a comment.